koideath - Brian Enos's Forums... Maku mozo! I had a limited style holster for a while. I found the best technique for me was the sweep draw. How often do you practice and shoot matches? Dry fire is extremely important almost more important than live fire just because it's safer and cheaper. Haha. I shot maybe 150 rounds 2 weeks before the Virginia state idpa championship with hours of dry fire though and took 1st in ESP Expert. Pistols you can shoot in any sport? I use a CZ SP-01 shadow for all my matches. 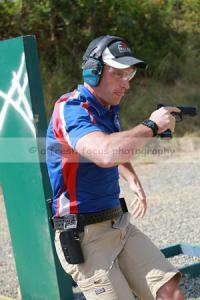 I get 1st overall most of the time in 3-gun, USPSA, IDPA and steel challenge. Used it at the southeastern 3-gun regional this year and hung with the best of them on pistol. Oh nice the ol Jerry Miculek trick! I shot a 3-gun match that required shooters to run down a hill while it was raining. Had a bunch of people fall. I ended up getting 1st because I took the rain into consideration and slowed down a bit. When did you switch from original iron sights... and to what? My thoughts e This is always a good option to consider, and particularly good advice for a novice shooter. It's almost as fast as doing it on the move and easier than sticking the load on the move while minding the 180. My thought exactly. I do it mainly when I realize that I didn't take into account a reload going right to left in my stage walk through. What problems are the grip causing? Are your splits slower? Are you shooting to a specific direction compared to non-1911 pistols? Thanks. Why do I really shoot? I shoot because I enjoy bettering myself. The gains I achieve are quick and satisfying. It keeps me coming back for more. I normally place them in the order that I am going to shoot them as well. I use and ELS belt and will throw an old ap customs 4x4 with extra slugs in case I need an extra. Here is a drill I do a lot. Another one I like is using a texas star and its 2 shots on the bottom plates, throw a quad, and finish the texas star. Also shooting the plate rack while moving from one position to another. How do I get into A class? Get someone to video you at your matches. That has really helped me. I can see where my hiccups are and then work on those in dry fire sessions or live fire.